The lake today were moody as high pressure set in. Carp were in a difficult mood on both lakes and the flyer pegs failed to produce. 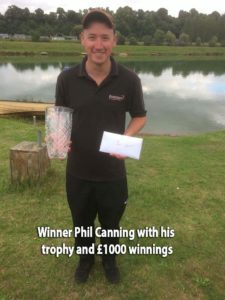 Winner of this prestigious event was Phil Canning (Frenzee) from peg 64 on the Match Lake. Phil fished 6m pole with hard banded pellet and later down his edge with meat to weigh 130-07-00. Phil collected a bumper £1000 and the glass trophy. 2nd on the day was Andy Lumb (Low Hills) who drew peg 4 on the Match Lake weighing 108-11-00. Andy fished paste at 6m all day landing all quality carp. 3rd placed Shaun McCarthy (Mosella) drew peg 62 on the Specimen chalet bank and fished bomb & pellet all match. Shaun landed 101-05-00 of carp and bream. 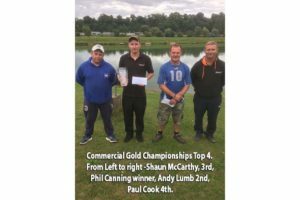 4th on the day was Paul Cook (Frenzee) who drew peg 64 on the Specimen Lake landing 87-02-00 to method feeder fished at distance. 5th on the day was Stu Homewood (Bag’em / Scorpion) landing 76-10-00 from peg 58 on the Match Lake. 6th overall was Neil Colcombe (Larford) who drew peg 74 on the Specimen Lake weighing 76-00-00.